spatiul.ro Review 2019: Is spatiul.ro a Good Hosting? Spatiul Ro is a Romanian hosting company with its own data center. New website owners will be happy with its well-priced plans that offer beginner-friendly features. Romanian website hosting company Spatiul Ro was founded in 2007. It has its own data center and it hosts more than 20,000 domains. The Spatiul Ro website is available in Romanian. For beginner webmasters, all plans come with the popular cPanel control panel, the Softaculous auto-installer, and – although it’s not immediately apparent from the company’s website – you also the Weebly website building tool. Advanced users get support for PHP versions 5 through 7, but (as confirmed with support) no other advanced programming languages. If you want SSH access, you’ll need to purchase a VPS plan. Other value-added features include SEO Tools, daily R1Soft backups, AntiSpam, and LiteSpeed web servers. Also, the servers have SSD storage, which should mean disk read/write speeds up to ten times faster than regular HDD. Spatial Ro owns its own data center, Data Center Ro, located in Iasi, Romania. It’s always good when a company owns its own servers and center since this generally means a faster response times to technical issues. The 99.8% uptime guarantee is below the industry average of 99.9%. Special Ro’s hosting plans are well priced, especially considering the performance-enhancing features such as SSD storage and CloudLinux. The plans come with a free SSL certificate, but domain names cost extra. You can select terms ranging from three months to three years at the checkout, and you can get a decent discount for purchasing a longer-term plan up front. You can also purchase AntiSpam Premium as an addon during the checkout process. The good customer service is complemented by a small helpdesk section containing a selection of documents including tutorials. Spatiul Ro offers beginner-friendly hosting plans backed by Cisco and Intel hardware. Whilst there’s no support for advanced scripting languages except for PHP, the plans are well-priced, and the customer service is efficient. 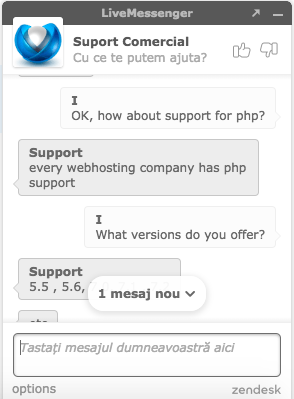 CTA: Buy beginner-friendly hosting from spatiul.ro! Wondering how spatiul.ro stacks up against other Web Hosting companies? Enter any other Web Hosting company and we will give you a side-by-side comparison.